Roar2 is a modification of the original Roar which had a plumb stem. After I had designed, built, and paddled Toto with its V entry bow I went back and cut the lower plumb bow off my Roar and converted it to a Toto-like bow. So Roar2 has a deep V entry which is carried well aft. 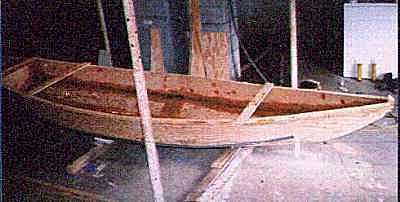 About two feet of the sharp bow is immersed and provides a skeg action forward. As a result Roar2 behaves well in all aspects of wind and waves and is more capable in rough going. The new shape makes a different sound - a "swish, gurgle" as it cleaves the water, where the original Roar has a "tap, tap" sound typical of boats that go over the water instead of through it. I suspect the original shape is slightly faster in smooth water but the new bow has the edge everywhere else. 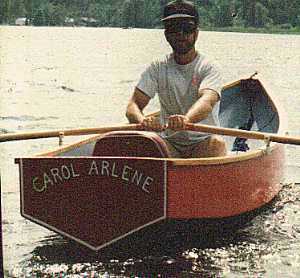 She'll row at 4-1/2 mph with medium effort using the 7 foot oars detailed in the plans. Adding a passenger to either version will hardly slow her, although acceleration and deceleration are affected. 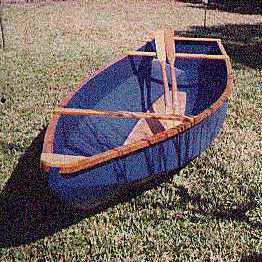 These are excellent camping boats, light enough to solo cartop, large enough for much gear and with a flat bottom plank long enough to sleep on while the whole rig sits upright. Kevin Garber took a Roar2 on a three day row of the Big Bend region of the Rio Grand, seeing no humans from put-in to take-out. He brought a folding chair, a barbecue, and a tent fly with poles. In camp he set up the fly over the hull and slept in the boat. Taped seam construction from four sheets of 1/4" plywood. No lofting or building jigs.